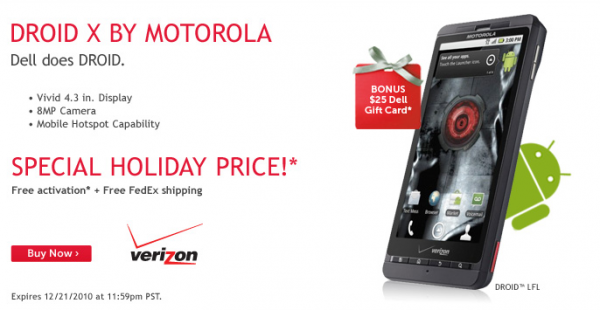 Normally when a phone like the Droid X hits the “FREE” category, that’s a big enough announcement, but Dell has taken it a step further. If you buy a DX from their online store, not only will you get the device for free, but they’ll toss in a $25 gift card with it. Not bad right? We saw this same deal for the Incredible last month, but Dell decided to step their game up for a last minute X-mas push using almost all of the Droid devices. You will find this $25 gift card deal for the Incredible (again), Pro and DX. Who’s buying?